Air in voids within a concrete slab can expand in conditions of rising temperature. If there is a pathway to the surface, this air can cause bubbling on a freshly applied primer or coating. This is often called outgassing. Dealing with this issue in horizontal flooring applications is more straightforward. Gravity will always assist both the surface preparation process itself and the penetration of the primer / coating into the void. However, vertical surfaces can be more problematic. 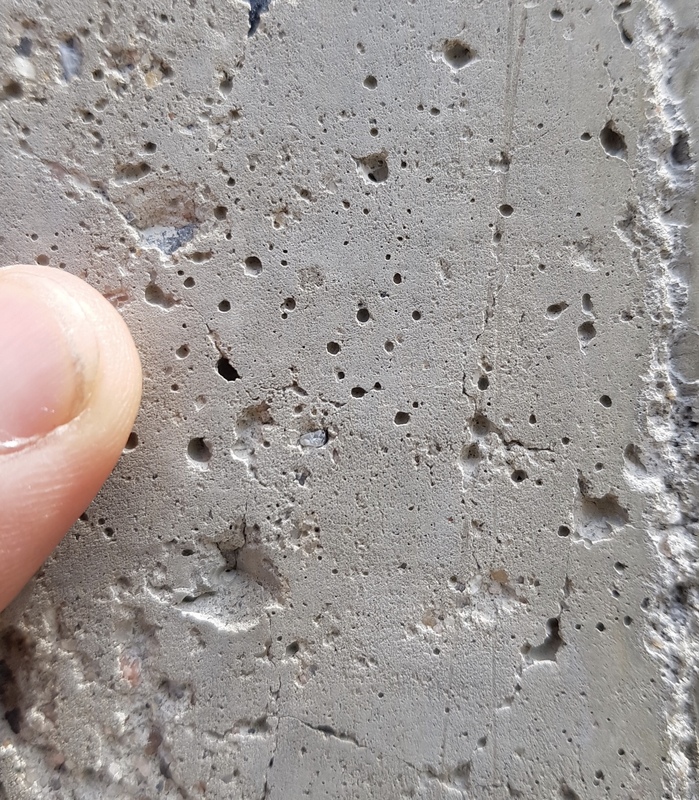 Surface imperfections and bug holes on vertical concrete structures can be a direct result of the restricted compaction at the vertical formwork interface during concrete placement. Recent experience has shown that abrasive blasting of the these vertical structures can eliminate or reduce the “omega fins” that can exist at the surface of the concrete. This will allow fuller penetration without air entrapment. In general, for both floors and walls, application in conditions of declining temperature within the concrete structure itself will reduce or eliminate the outgassing. Note: The temperature of any concrete structure may still increase when air temperature is stable or even declining due to the influence of solar radiation.